This chart covers the week commencing February 11th to February 17th. To the surprise of no one, Apex Legends enjoys another week at the top of the chart. Respawn's fresh battle royale offering has captured the hearts and hands of gamers across the land, and it's 45.1 million hours across streaming platforms can attest to that. League of Legends takes its usual place at number two, racking up 28.8 million hours watched in the last week. While the battle royale chaos ensues around it, it's fair to say that Riot Games long-running MOBA is safe in silver for the time being. Remember Fortnite? It's still down in third place, after another 1.3 per cent decrease in hours watched. 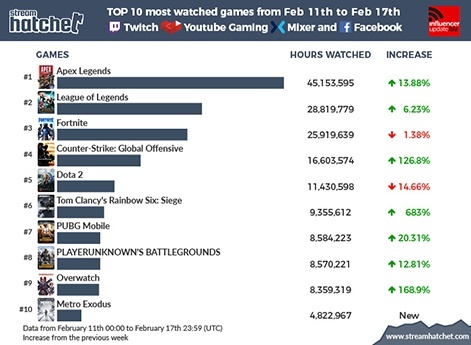 While the views are dwindling as a result of Apex hype, it's still almost 10 million hours clear of number four on the list, which is CS:GO. However, views for Valve's shooter rocketed by 126.8 per cent last week. Dota 2 is in fifth place, down from fourth after a 14.6 per cent decrease in views. 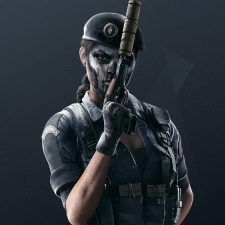 An apt new entry at sixth is Rainbow Six: Siege, which increased by a whopping 683 per cent last week. Ubisoft recently rolled out some fresh announcements for the game, including a new expansion. PUBG Mobile moves up one place into seventh after a 20.3 per cent rise in hours watched last week. It's PC and console-based older sibling PUBG sits less than 14k hours watched behind it after a 12.8 per cent increase in views last week. Overwatch takes ninth place and makes a return to the chart with a 168 per cent increase in hours watched last week; the return of the Overwatch League last Wednesday may attribute to those big numbers. Metro Exodus closes last week's chart, amassing over 4.8 million hours in its first week. Top 10 streamed games of the week: Is Minecraft making a comeback?